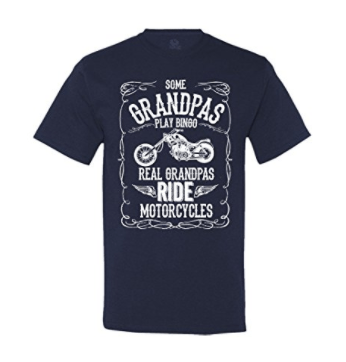 If you have a motorcycle rider in your life (or a soon to be rider!) there are some great gifts out there that can make their life easier and safer. 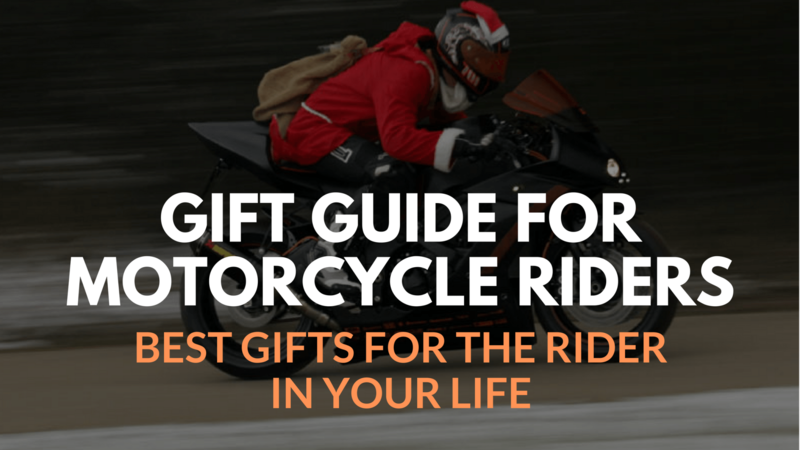 This is the best Gift Guide for motorcycle riders. These gifts are listed in no particular order. Get what makes sense for your loved one. There is something on this list for every type of rider, from harley’s to sportsbikes. This book by Lee Parks has over 300 reviews on amazon and 4.6 out of 5 stars. 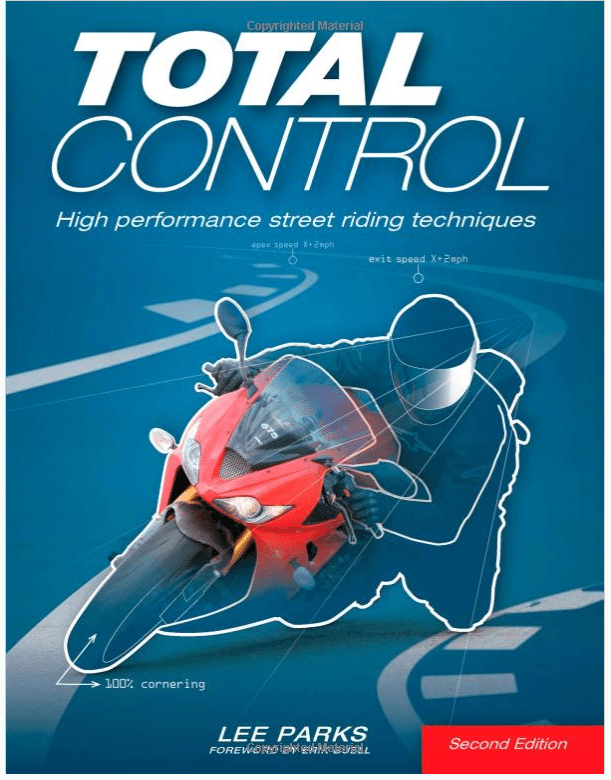 That’s because this book is amazing and will give that street rider in your life some improved skills to help keep them safe when out on the road. If you do any motorcycle maintenance then motorcycle stands are an absolute must have. I typically recommend Pitbull motorcycle stands, but they run close to $150 each. 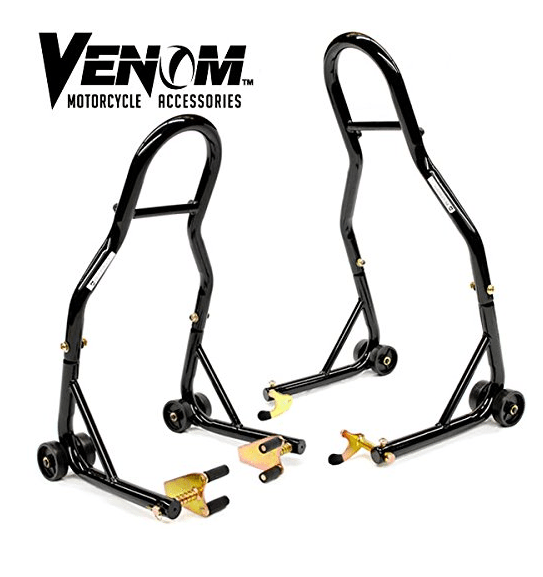 They are great and worth the price, but if you are on a tighter budget then these Venom stands are a great value. You get two stands for half the price of one pitbull. With stands like these it is important to remember to get spools for your specific motorcycle (they are what the stands grip onto in order to lift the motorcycle). Ride around on a motorcycle long enough and you are bound to get a flat tire. Unlike a car there is no way to keep a spare tire with you on a motorcycle, so your only option is to repair the tire on the side of the road (or call for a tow truck). I had the pleasure to use this exact tire repair kit when I got a flat on my Kawasaki Ninja. 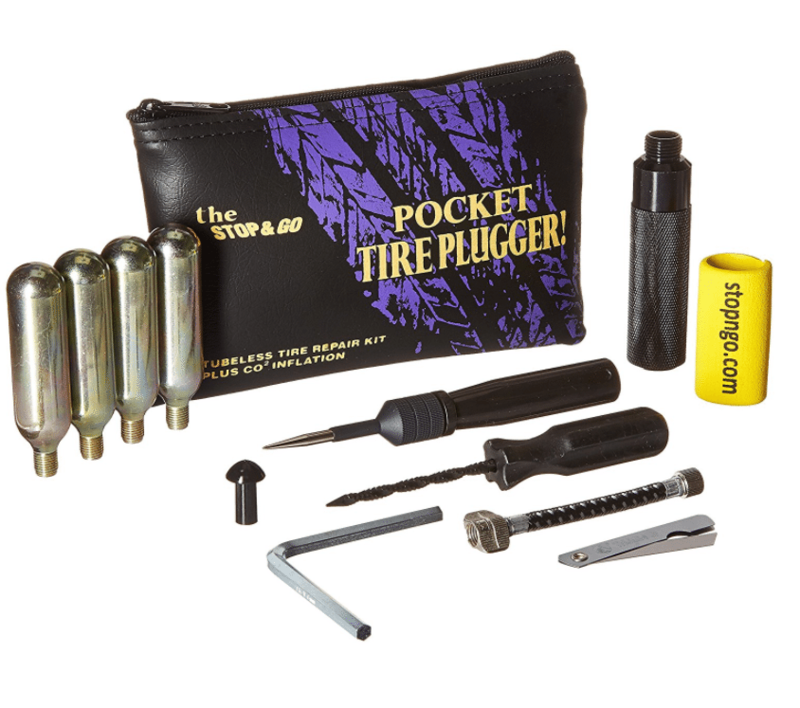 This kit has everything you need, including air canisters to inflate the tire after you make the repair. It is also small enough to tuck away in most motorcycle storage areas. You can be up and riding again in less than 20 minutes. For years I didn’t have a car, only a motorcycle. The thing I remember most about that time is the COLD weather! 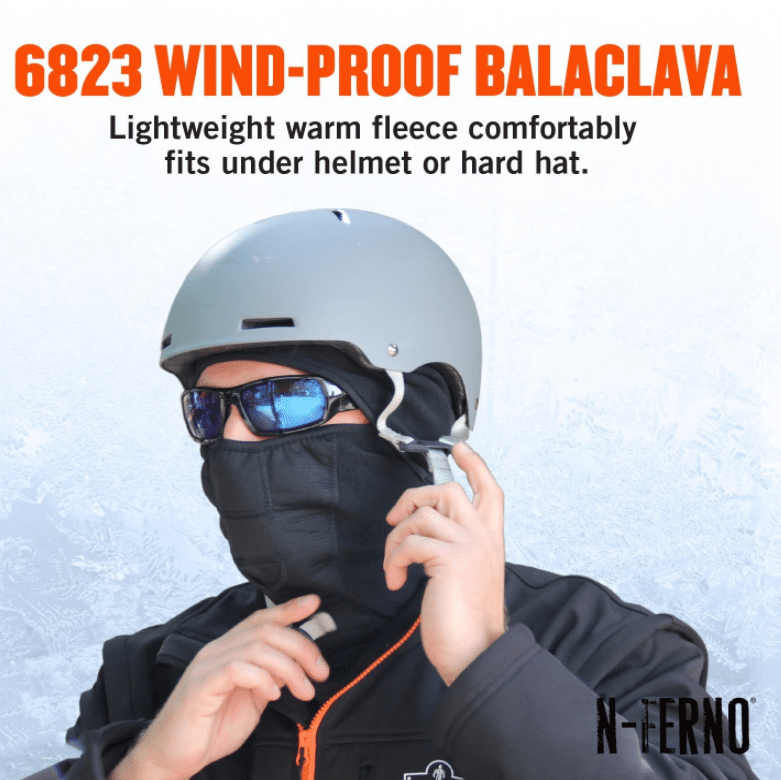 I got myself a balaclava just like this one to wear underneath my full face helmet. It really helped keep my face and neck so much warmer! I highly recommend it if the motorcycle rider in your life rides all year long. Another great gift to tuck away in the motorcycle storage compartment is the leatherman multi-tool. You don’t have much space in a motorcycle’s trunk, so you really have to pick and choose which tools you want with you. 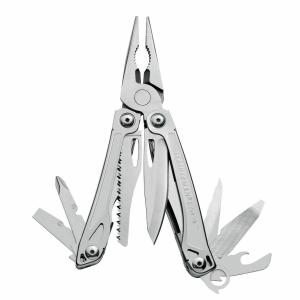 The leatherman is a great multi-tool that can fit in a pocket or in a storage compartment. Great for tight spaces. It has a knife, saw, needle nose pliers, screw driver, bottle opener etc… 17 tools in all. Chances are the motorcycle already came with a set of small tools, but this leatherman will fill in the gaps where that tool pack is lacking. Printed with waterbased eco friendly inks providing great durability! Perfect for recording amazing adventures on a motorcycle, the GoPro Professional-grade full HD video camera is perfect gift for your motorcycle obsessive who will probably record almost every trip. With 60 frames per second option in 720p it is a high end solution that also has some great user friendly features like wide lens view to make sure you don’t miss anything and the ability to edit your videos in iMovie or Windows Movie Maker. 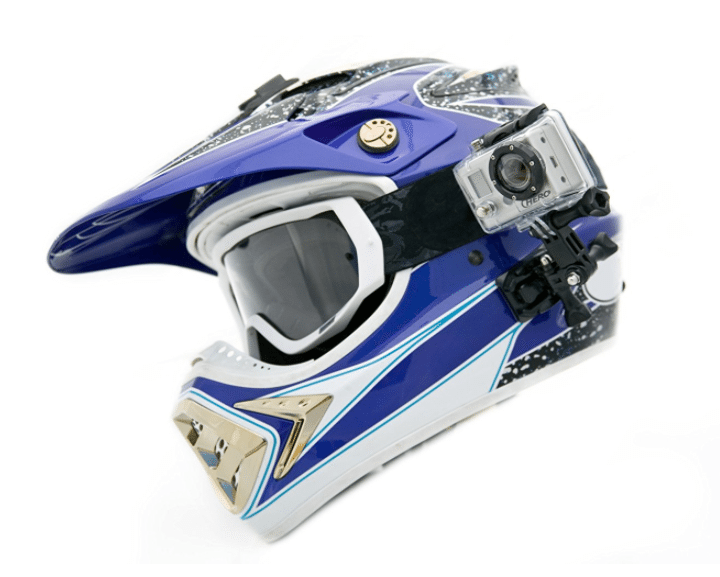 Best of all, this GoPro camera comes with mounts for attaching the GoPro to any helmet, motorcycle or ATV. 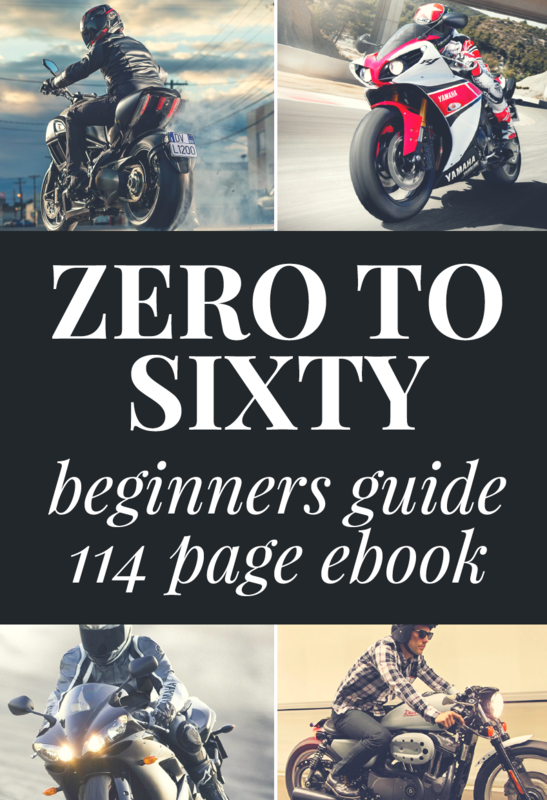 This is one of our favorite motorcycle books and is a staple in most riders bathrooms (yes bathrooms). 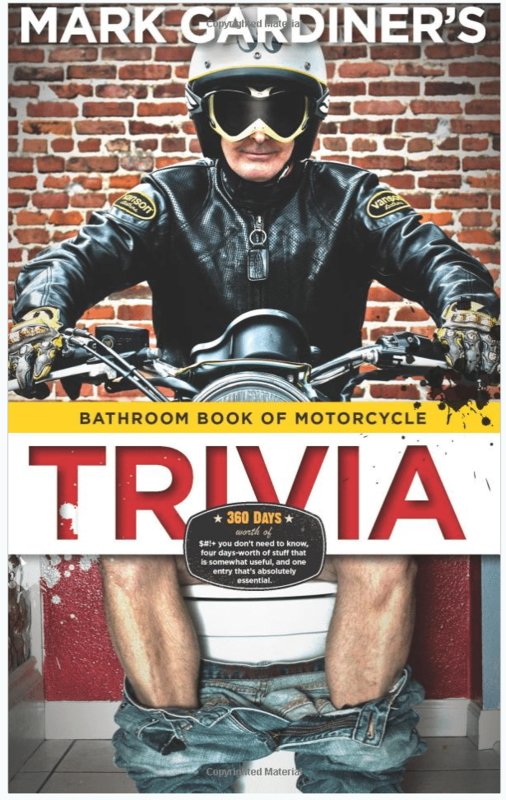 This fun Bathroom Book of Motorcycle Trivia is chock full of trivia (like so much trivia you will probably have a motorcycle fanatic spending way more time in the bathroom than is natural). 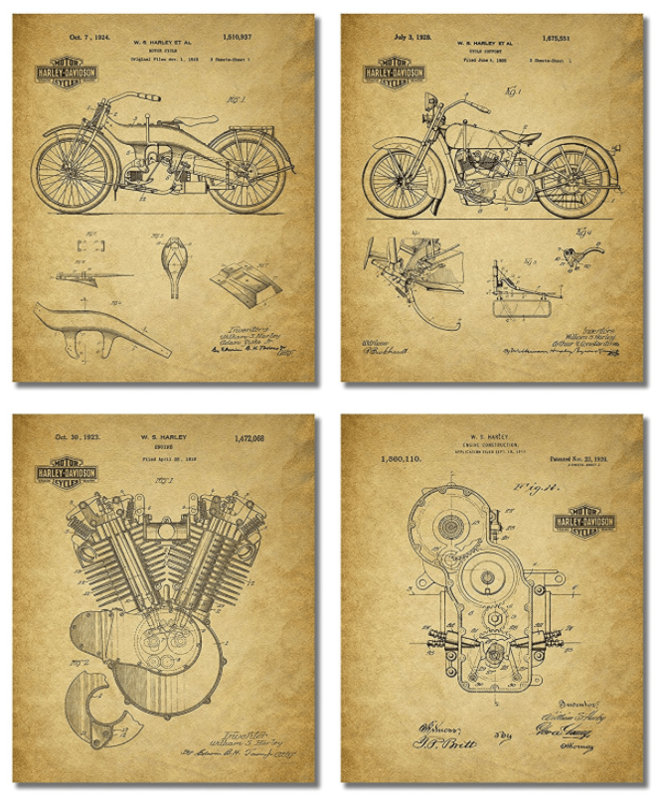 What was the first production motorcycle with electronic fuel injection? (Honda CX500 Turbo, 1982) Day 106: Why is Mike Hailwood still the best road racer who’s ever lived, no matter what Valentino Rossi’s fans say? (Two words. No, two letters: TT). This a funny and entertaining gift for the motorcycle guy/gal in your life with the added bonus of them thinking about you when in the bathroom. A solid pair of motorcycle gloves will protect your loved one yet it is often the one thing that motorcycle fans don’t invest in. We’ve seen our share of ratty gloves that look out of date and are missing important safety features. 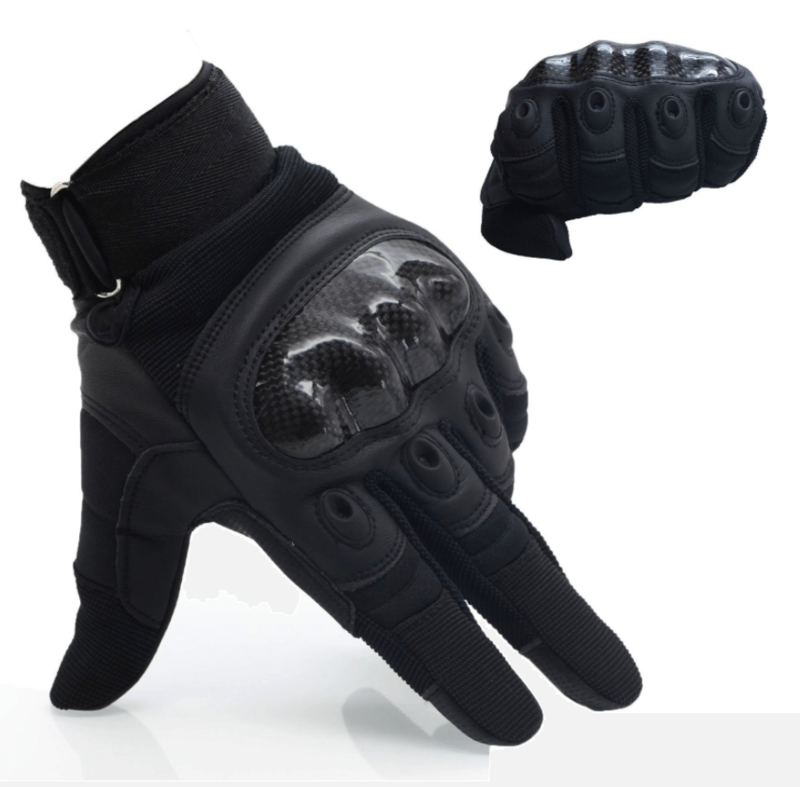 Why not give the motorcycle rider in your life an upgraded pair of gift of cool motorcycle gloves with reinforced stitching and carbon fiber knuckles for great protection. They have tech-friendly sensors on index finger and thumb so they can still use their phone and check Facebook. The OMGAI Men’s Motorcycle Gloves have a useful adjustable strap with hook and loop closure that we found really protects wrists better that other gloves we tested. 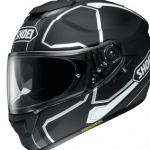 A practical and safe motorcycle-related gift suggestion that’s all about protecting your loved one. Portable Mini-Air Compressor. Sounds boring but it is going to be the gift that keeps on giving (in cases of an emergency of course). 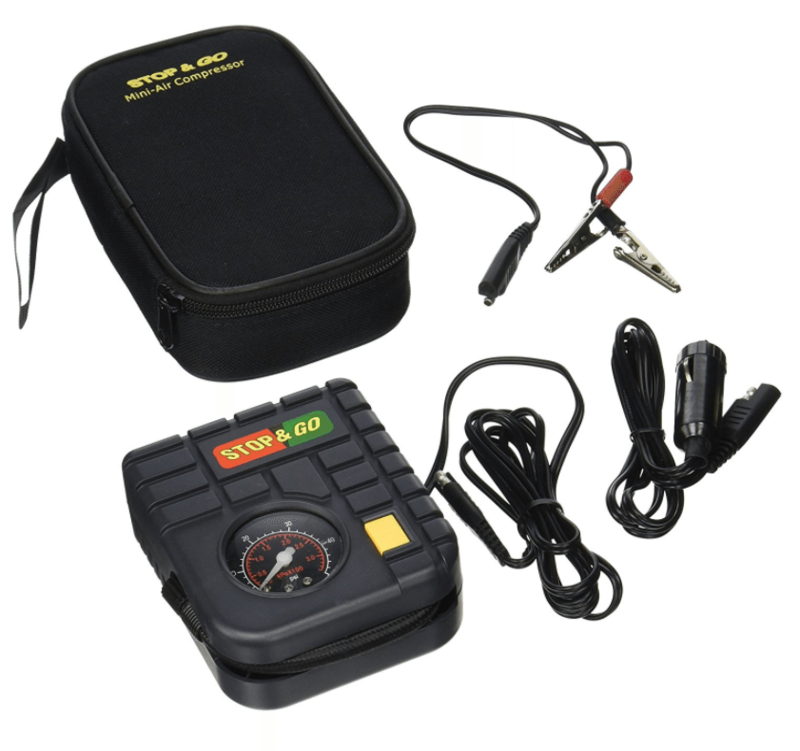 At 4″x 2″ x 6″ this diminutive air compressor can be carried on any motorcycle. It has a built in gauge allows you to observe the increased pressure with a reading up to 50 psi. 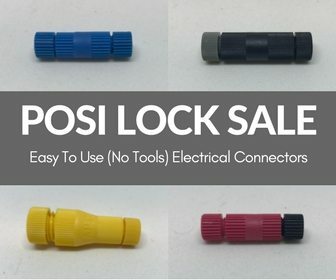 Practical motorcycle gift? We think so. One of the joys of motorcycles is the long road trip with friends. 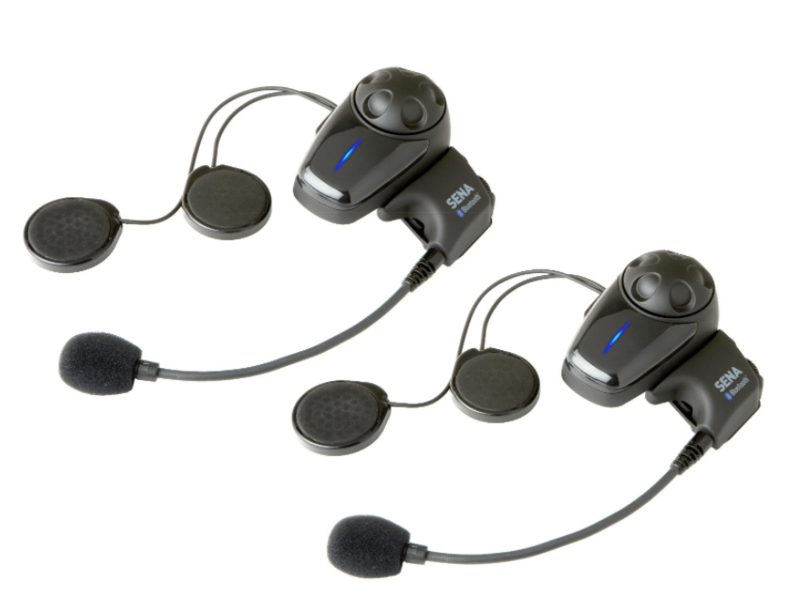 This Sena Intercom and Headset is one of our favorite tech gifts for motorcycle obsessives. It comes with long-range music sharing and intercom that reaches almost 1,000 yards. With Bluetooth connectivity to listen to and share music, make phone calls with speed dialing, and participate in a four-way intercom conversation it is the perfect companion for long trips with friends. Best earplug in the world. The first and only universal earplug with the filter inside the ear. Hearing protection with the best sound quality thanks to ceramic filter it has the best acoustics, no muffling effect but dampened. 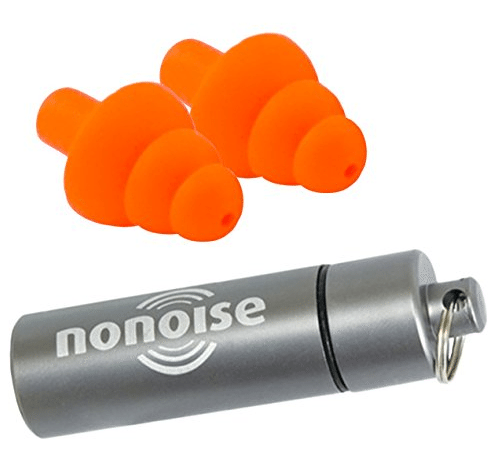 This give will help reduce engine and wind noise for racing and touring, just the thing a motorcycle rider wants to improve his/her time or to be able to take in more of the scenery. Comfortable for everyday use, silicone-free, hypoallergenic thermoplastics used, this is a great stocking stuffer. 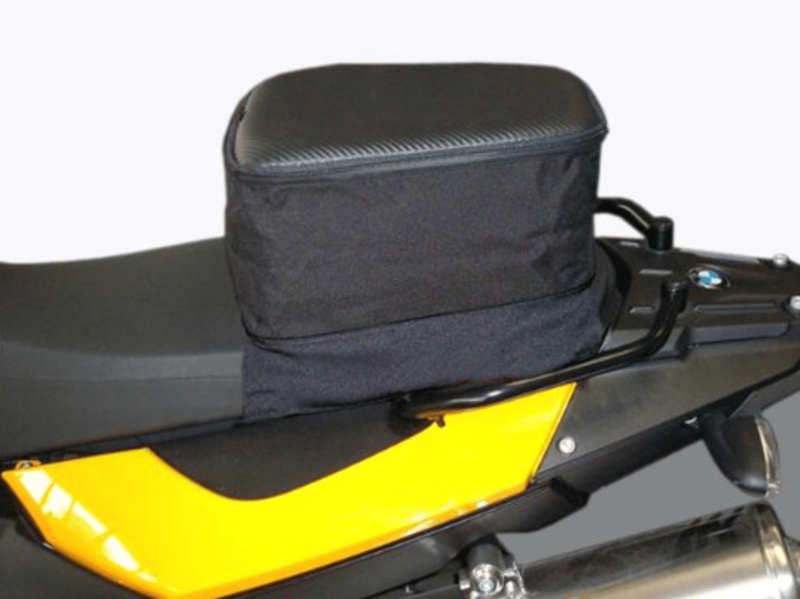 The universal tail bags attach to a motorcycle’s passenger seat. When expanded, FastPack is big enough for lunch and a jacket liner, or an overnight change of clothes. This is a great gift if you’re married to the motorcycle rider who is always doing long trips and complains about never having enough room to take along those extra odds and ends of riding gear. If you know a Ducati rider or just a rider who loves bikes this is the perfect coffee table gift. Ducati’s official museum celebrates the racing heritage that’s driven the company for more than half a century. 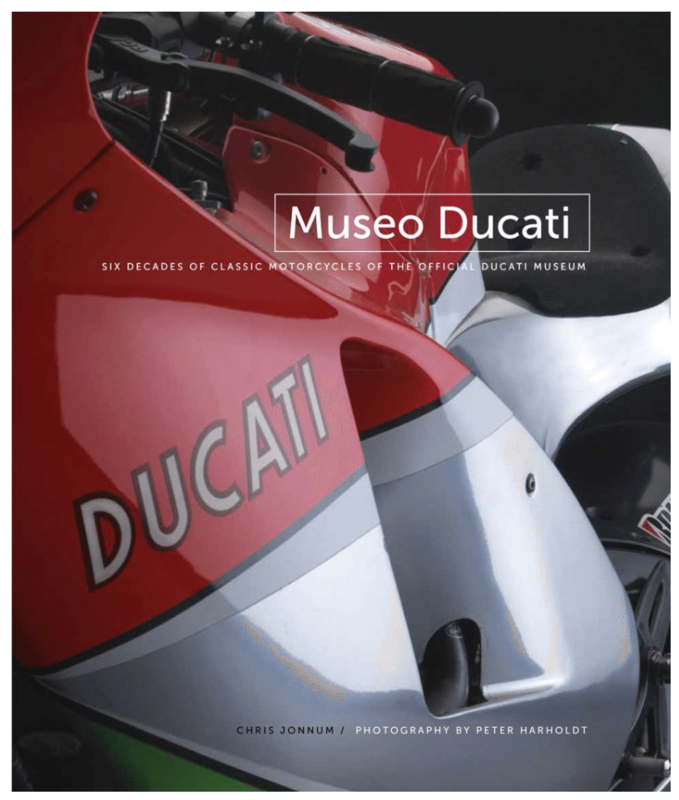 In Museo Ducati, Chris Jonnum and Peter Harholdt profile the greatest motorcycles displayed there. The tour begins with a 1947 Cucciolo motorized bicycle and ends with the 2010 Desmosedici GP10 ridden by 2006 MotoGP champion Nicky Hayden. Other highlights include the 900 Super Sport prepared for Mike Hailwood’s 1978 win at the Isle of Man TT, and the 1990 851 that Raymond Roche rode to Ducati’s first World Superbike championship. The bikes are shown in stunning detail through photographs that reveal their overall design as well as details of engines and other components. And the vivid text explains each model’s technical features along with its performance on the track. We admit that you really need to love somebody to buy them these boots because they aren’t cheap. 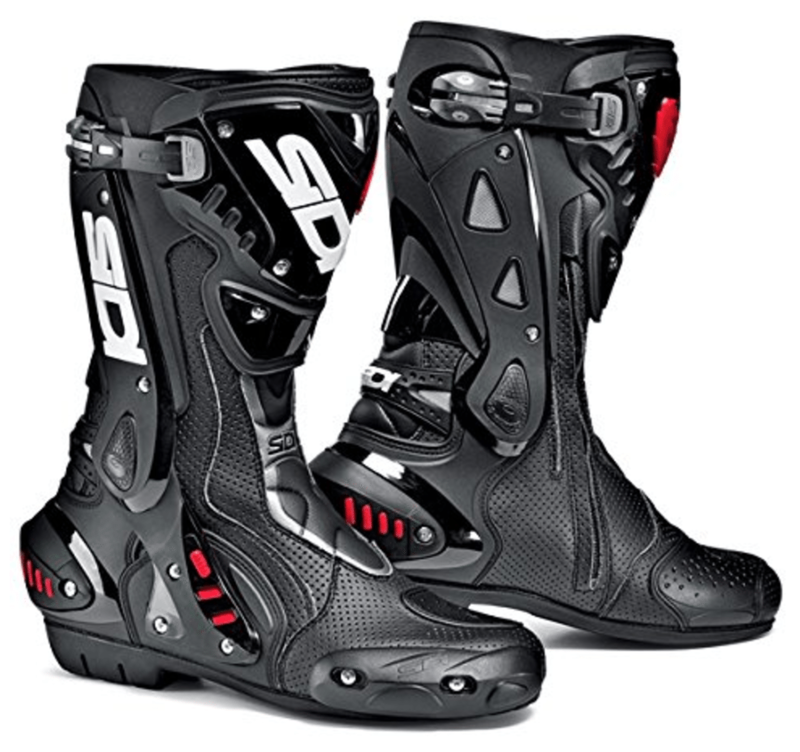 This boot is awesome and is an impressive gift for any true motorcycle lover in your life. Take a look, they are both stunning and very practical. We highly recommend.